Apple is Preparing iPhone Nano? Apple reportedly is preparing a small-sized low-priced iPhone. mini iPhone that will be launched simultaneously with iPhone 5 later this year. The news was said by Apple products supply company in Taiwan. That smartphone will be named iPhone Nano. As the name implies, this low-cost version of the iPhone will carry different physical dimensions of standard iPhone. iPhone nano Photos has even been spread on the Internet. 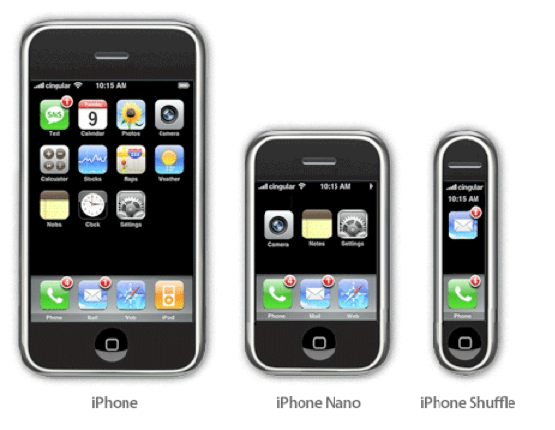 iPhone Nano predicted will as big as iPhone nano and it can be used as wristwatch. Expensive price of iPhone makes middle class people hard to reach them. New iPhone 3G price has been lowered. But it is still considered quite expensive, especially when compared with the price of Android smartphone. If Apple really makes iPhone Nano, Apple seems about to expand its market into low-end market. Beside iPhone Nano, Apple is also reportedly preparing iPhone Shuffle, which will also be priced at a relatively affordable.